Designed by blind spouses Roger and Margaret Wilson-Hinds, Georgie is a comprehensive smartphone app using a combination of voice recognition software, haptic capability and customized controls. The simple, tailored app lets blind users operate handsets with ease, essentially creating a platform to transform regular smartphones into mobile devices customized for the visually-impaired. Qualcomm and Project RAY, which designs accessibility tools for blind and visually impaired people, today announced that they have developed the RAY mobile device, a smartphone that is synchronized with Israel’s Central Library for the Blind, Visually Impaired and Handicapped audio books content. Today, the majority of blind and visually impaired people use simple 2G mobile phones for voice telephony only. In addition, they depend on an array of specialty devices which are prohibitively expensive. Based on an off-the-shelf Android OS smartphone powered by Qualcomm’s Snapdragon processor, the Project RAY device integrates the capabilities of smartphone technology and the capabilities of these multiple specialty devices into a single handset and a UI designed for eye-free interaction. A trial project is currently underway that is testing the new system with 100 participants throughout Israel. 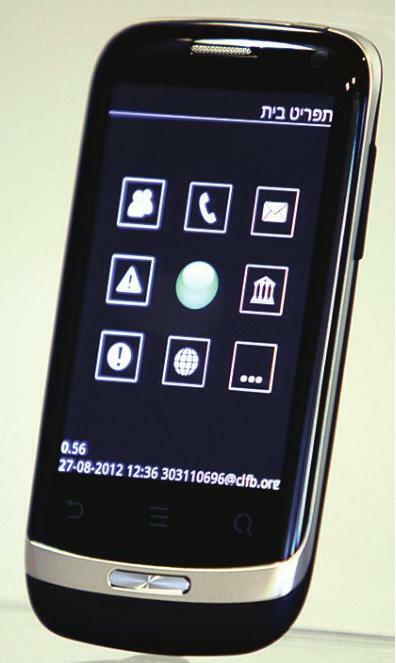 The Clarity mobile phone concept by designer Mark DiLella has a host of features that aim to help the visually impaired make full use of the device. Its Braille interface is easy to use and able to display over 100 characters. The keyboard with six keys should be familiar to users of the Perkins Brailler, and two additional user-definable keys can provide access to apps, settings or contacts. A second rear display shows any missed calls, new messages and voicemails the user has received. The phone’s main and secondary menus can be customized to allow frequently used apps to appear higher for fast access. Optional text-to-speech integration lets the user navigate and fully enjoy all the features of their mobile phone, and two large speakers on the bottom of the design provide clear playback. 26 queries in 0.340 seconds.